Making your own king size padded headboard is one of the easiest craft projects and its visual impact can dramatically alter the appearance of your bedroom. You can find the fabric, batting and adhesive at your local fabric store or online. All of the other materials are at your local home improvement store, where you can even get the plywood cut for you at no additional charge. Determine the height you prefer for the headboard for your king size bed. The materials list included here is for a padded headboard measuring 80 inches long and 4 feet high. 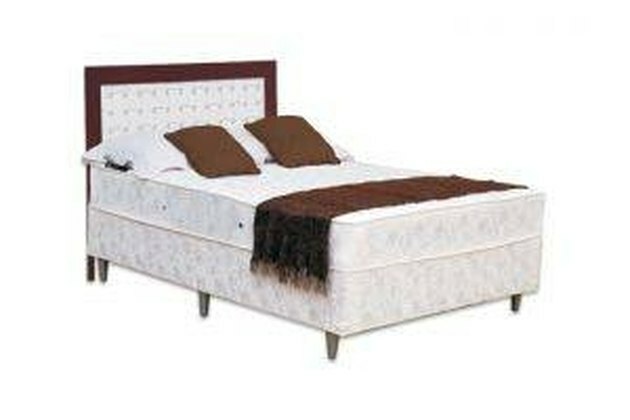 Standard king size beds are 76 inches wide, so this padded headboard adds 2 inches to either side of the mattress edge. The height is for effect. You could make a less conspicuous 2- or 3-foot tall headboard. Locate the wall studs and mark the plywood edge to match the location of the studs. Determine how high you wish to place your headboard and attach the wall mounts to the plywood and the wall according to the manufacturer's directions. It's easier to complete this step before the padding and fabric are attached to the plywood. Cut the batting to fit the plywood, adding 2 inches around the perimeter so that your edges are also padded. Place the plywood on a flat surface and lightly spray it with adhesive. Position the batting on top of the adhesive and press down. For more padding, add another layer of adhesive and batting on top of the first. Let the adhesive dry. Lay your fabric face down on a flat surface. Position the padded plywood face down in the center of the fabric. Beginning in the middle of one of the 80-inch sides, pull the fabric up over the edge of the plywood and the batting and staple it. 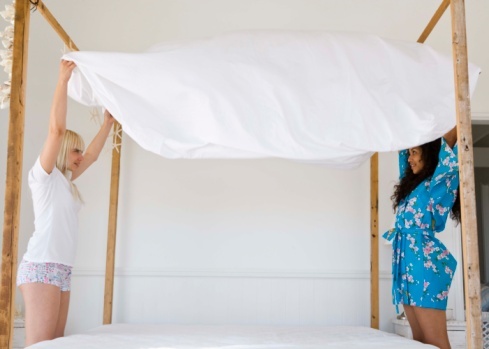 Pull the fabric taut, but not too tight as you work your way around the perimeter of the headboard, stapling every ¼ inch or so. Flip the headboard over and hang it in place.